There are two key candidates to look out for in the presidential elections, incumbent President Petro Poroshenko, who is seeking another term, and Volodymyr Zelenskiy, an actor and comedian and relative newcomer to politics. Mr Poroshenko has little to no political experience, but in the eyes of voters, he is a fresh face amidst corruption across the country. The actor and comedian stars as a fictional president in popular TV series Servant of the People. What happened in the first round of votes? What had been a full ballot list of 39 candidates has now become a two-horse race. 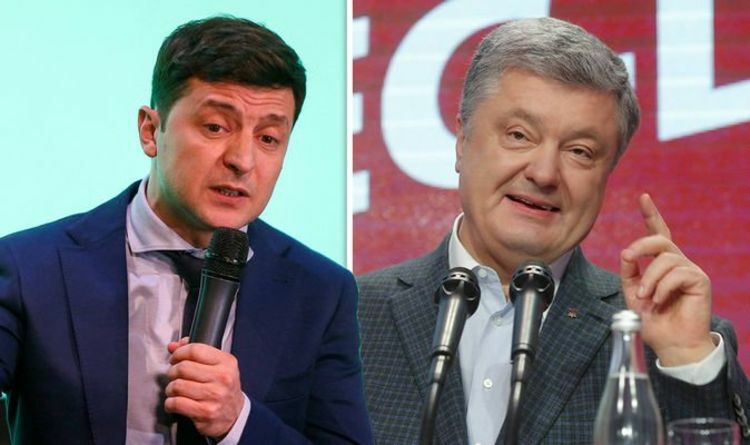 Mr Zelenskiy and current president Poroshenko will go head to head in the second round of votes on April 21. Mr Zelenskiy’s campaign centred on his anti-establishment views, and despite his popularity has been criticised for lack of political experience. The actor must convince voters he can take control in a country which has been at war since protests in 2014. These protests overthrew a pro-Kremlin government and saw Russia annex the Crimean peninsula. Despite his lack of experience, Mr Zelenskiy took the lead in the first round of voting as of the votes counted on Monday morning. There have been 50.4 percent of votes counted, of which the comedian had 30.2 percent according to the Central Election Commission. President Poroshenko stood at just 16.6 percent, and third place was held by former Prime Minister Yulia Tymoshenko with 13.1 percent. With the second round of votes choosing between Mr Zelenskiy and President Poroshenko still to come the result is not yet obvious. However, should the results follow that of this round - Mr Zelenskiy could indeed be elected President. After hearing the news of the lead he had taken in the first round, Mr Zelenskiy addressed supporters. He said: “I would like to say 'thank you' to all the Ukrainians who did not vote just for fun. “It is only the beginning, we will not relax." Whilst President Poroshenko dubbed the result a “severe lesson” especially from younger voters, urging their support in the second round of voting. President Poroshenko aimed to portray Zelenskiy as unfit to represent Ukraine abroad, especially when taking on Russian President Vladimir Putin in international talks. Mr Poroshenko said that Mr Putin "dreams of a soft, pliant, tender, giggling, inexperienced, weak, ideologically amorphous and politically undecided president of Ukraine. Are we really going to give him that opportunity?"